Yesterday's post included a picture of LEGO-inspired cookies and that got me thinking: we don't have any LEGO in the kitchen. And since brick-styled fruit snacks are no longer available, I wasn't sure how many options were left. Well, thankfully the good folks at LEGO have a bevy of kitchen accessories and gadgets to solve that problem. There are not one, but two cookie cutters, in the shape of minifigs and a rolling bricks. 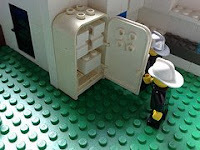 Should you want to add LEGO to your kitchen and aren't a fan of cookies, Evil Mad Scientist Laboratories has you covered with a series of candy dishes, vases, and bowls built of bricks.